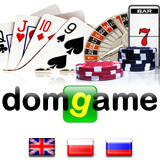 Domgame.com has launched an online casino and poker room for players in central and eastern Europe. The site features hundreds of casino games from Net Entertainment and the poker room is part of the Entraction network. The casino, which caters to Russian, Polish and soon Hungarian players, features weekly Blackjack, slots and Roulette tournaments. The poker room also hosts tournaments including online qualifiers for the European Masters of Poker (EMOP). Domgame offers Eastern European casino players a progressive jackpot pool currently well over €600,000 and climbing quickly with every Euro, Ruble and Zloty wagered on designated slots and blackjack games. The biggest single jackpot available is on the Arabian Nights slot machine where the progressive jackpot is nearly €400,000. The next EMOP event will be in Malta 17-20 November. Domgame players can win seats by winning one of three EMOP satellite tournaments held Tuesdays, Thursdays and Sundays at 20:40 CET. Players can even win free seats at these satellites by winning one of the daily qualifiers starting with buy-ins from €2 or 200 VIP points. A full list of qualifiers and satellites is listed in the lobby.